eld square. Thus, although the "points" of the bases are 90 feet apart, the physical distance between each successive pair of base markers is closer to 88 feet. The lines from home plate to first and third bases extend to the nearest fence, stand or other obstruction and are called the foul lines. The portion of the playing field between (and including) the foul lines is fair territory; the rest is "foul territory." The area in the vicinity of the square formed by the bases is called the infield; fair territory outside the infield is known as the outfield. 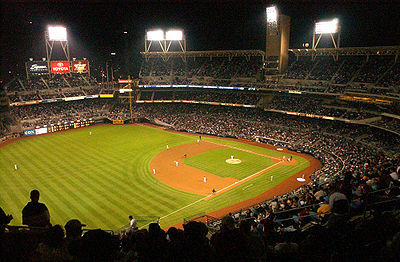 Most baseball fields are enclosed with a fence that marks the outer edge of the outfield. The fence is usually set at a distance ranging from 300 to 410 feet (90 to 125 m) from home plate. Most professional and college baseball fields have a right and left foul pole. These poles are at the intersection of the foul lines and the respective ends of the outfield fence and, unless otherwise specified within the ground rules, lie in fair territory. Thus, a batted ball that passes over the outfield wall in flight and touches the foul pole is a fair ball and the batter is awarded a home run. Another common feature of baseball fields is a warning track, a narrow dirt path that follows the outer edge of the outfield at the fence to serve to warn outfielders, who may be backing up, of their proximity to the wall.